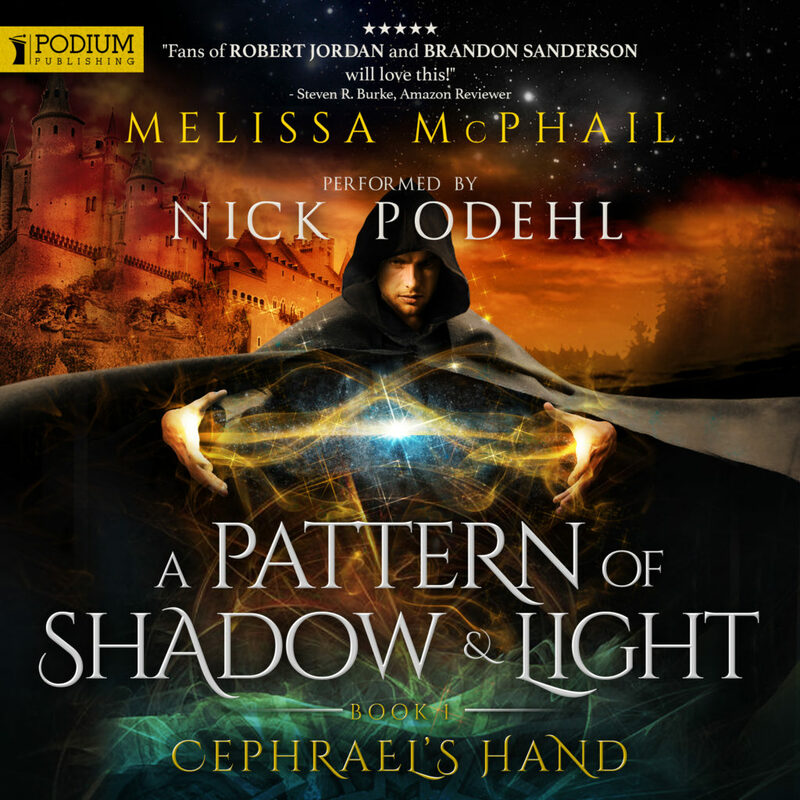 I’m thrilled to report to all of you audiobook lovers that today Cephrael’s Hand releases on Audible! I know this is a long-awaited moment for many of you, and you have my sincerest gratitude for being so patient. The book is narrated by the talented Nick Podehl, who also narrated Pat Rothfuss’s The Name of the Wind. Here’s a sample of Nick reading Cephrael’s Hand. I’m honored to be able to work with Podium Publishing to produce my fantasy series A Pattern of Shadow & Light for Audible. Podium has produced an illustrious catalog of audiobooks, including Andy Weir’s The Martian, Edward Robertson’s Cycle of Arawn series, and books by R.A. Salvatore. “The publishing landscape has drastically changed. Similar to the recent ebook revolution, the audiobook market is growing exponentially. And while most publishers are slowly trying to adapt, Podium Publishing is already perfectly positioned – now. “Authors are becoming increasingly well-informed and are taking things into their own hands: growing their platforms, negotiating their own agreements and looking for the earnings they deserve. So, at Podium Publishing, we do things differently. “We reach out to authors that are a good fit for us, rather than accept author submissions. “We prioritize the author’s interests, which may or may not include working through a literary agent. Podium is truly riding at the forefront of the indie publishing industry. Unlike some of the New York publishing houses, Podium is doing everything possible to form mutually beneficial relationship with its authors. I’m extremely grateful to Podium for taking an interest in my series. In terms of production for the rest of my series, book two, The Dagger of Adendigaeth, is in post-production now, and they will soon begin recording on book three, Paths of Alir. I don’t have release dates for these audiobooks yet, but based on the timeframe of production for Cephrael’s Hand, I would imagine they could be out by the end of the year (Podium is in charge of those releases, however, so this is merely speculation on my part). Yes! Thank you. I’m just finishing up Brent Week’s The Broken Eye and will begin Cephrael’s Hand…. Again. Audiobooks help me get through the work day. I am stoked! Downloaded it and am now off to read!!! I’m so glad to hear that, Debbie. Let me know what you think! Excellent! Nick Podehl is a great narrator and Podium Publishing has put out some worthy audiobooks – My husband and I have listened to several. That’s great to hear. I’ve loved what I’ve heard of his work. Early feedback is certainly giving lots of thumbs up. So that’s great to hear also. You said “they could be out by the end of the year”, what about a narrower time frame for just book 2? The audiobook is my first exposure to your work – amazing – and a little tough to follow all of the characters. Is there a cast list I can reference? It will help me with the pattern of who is who! Thanks for a cool new world to explore. Please ignore — found your glossary!!! so helpful! Glad you found it, Lisa. Let me know if you have any other confusions. You might find the Adept chart helpful also. I noticed that there is something odd about the text the audiobook uses and the one found in an ebook, they don’t entire match up. Is the audiobook version using a text with a different editor? Hi Jack, the audiobook is using the most recent edition (2014) of Cephrael’s Hand. This has a different chapter order from earlier editions. I’m not sure what edition you’re working from, but if your kindle (or hardcover) isn’t reflecting the same storyline, you may have an earlier edition. You can request the updated kindle edition from Amazon. They may not automatically have notified you. If you’re noticing other differences, please let me know. Thank you for listening! This is fantastic news! I loved your books and promptly read them all upon discovery. Just a week or two ago I decided to reread them and then you announce this! Perfect timing. I really like the narrator and I love hearing the proper pronunciation of all the names of people and places. Thank you for the great work! That’s wonderful to hear, Ryan. I’m thrilled that you’re enjoying the series and also now enjoying the Cephrael’s Hand audiobook. I also really like Nick Podehl’s take on the story. He has a way of drawing you in with his voice alone–which I suppose is exactly what you want in an audiobook narrator. I don’t usually push reviews, but if you’re of a mind to drop by Audible and rate the audiobook, I would really appreciate it. My publisher assures me that getting a lot of early ratings for the audio edition will help them release the second audiobook sooner. 😉 In either case, thank you for reading and listening! Please update us as to when The Dagger of Adendigaeth will be released on Audible. I just finished Cephreal’s Hand and ADORED IT! I’m so glad you enjoyed Cephrael’s Hand on Audible. I don’t have an exact release date from my publisher for the Dagger audiobook, but I’ve been told it should release towards the end of September or early October. When I know more I’ll post it to my blog and to my Facebook page. They’ve already recorded book 2 and are recording book 3 this week, so the wait shouldn’t be too long for either of the books. Thank you for listening! I couldn’t wait! I just bought the following two ebooks and have been devouring them. I’m glad to see that Alyneri has become less of a disaster in book two. Well, I’m glad you think so. 🙂 She and Ean have the longest growth arcs. Thank you for reading! My goodness, I haven’t been this satisfied with a fantasy since Words of Radiance or, perhaps, A Shadow of What Was Lost. I left a glowing review on audible, and sincerely wish you much more than well. For me, books like these are means of communication from author to reader (of course) but also, to a point, from reader to author. I think this is what distinguishes an author from a writer. Sorry for the mild digression. Again, thank you for your work, and can’t wait until book 2.
i just finished it 30 minutes ago. i came to this site to find info to see when the second and 3rd books will be released. the audio was 5 star in every way. but i hate it when i finish something so great, and cannot get started right away on the next one. podium, if you are reading this, can you release book 2 this afternoon please? I’m so glad you enjoyed the audiobook of Cephrael’s Hand, Tim. Dagger of Adendigaeth will be released on September 6th and should be available for preorder any day now on Audible. Paths of Alir (book 3) is in post production – so you’ll definitely get to keep moving through the audio editions of the series. If you haven’t posted a rating on Audible, I would really appreciate it if you do so. Lots of early reviews help my publisher keep the books high priority in their schedule. 😉 Thank you for listening! I just finished listening to Cephrael’s Hand on Audible and loved it! When I downloaded The Dagger of Adendigaeth I noticed Book 3 was not yet available as an audiobook. I am glad to hear it will be forthcoming!!!! Thanks.